J.R.R. 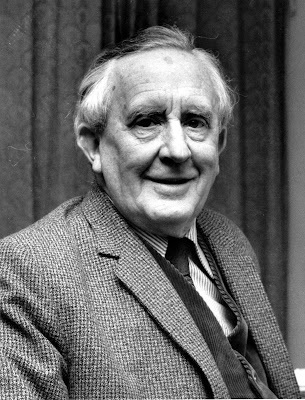 Tolkien, Oxford scholar of mediaeval English, died on 2nd September 1973, aged 81. He will be remembered for the story he wrote for his children about the adventures of Bilbo Baggins, a furry-footed hobbit who lived in a burrow in the Shire, a bucolic idyll of Anglo-Saxon Britain. The tale grew into a saga of warriors and wizards, elves, demons, trolls and goblins locked in an awesome struggle of good and evil, with the fate of Middle Earth hanging on a lost ring - the ring of the chillingly evil dark lord Sauron. Tolkien published his Lord of the Rings in 1955, but it was not until the 1960s that anybody really noticed the book. The otherworldly Tolkien suddenly found himself the revered guru of a whole generation of flower children, their psychedelic idyll threatened by the evil lord Nixon and military industrial complex. Tolkien cared little - he was scarcely aware of the modern world outside of his imagination. Other books include the Hobbit, and the rings saga continues in the Silmarillion, to be publish posthumously.